If you haven’t heard of Bgee’s for gene expression data in animals, it’s the perfect time to check it out. Bgee’s was revamped a month ago, with the introduction of gene pages and strong improvements to its user interface. Dr. Frederic Bastian, who manages the Bgee subteam in Prof. Robinson-Rechavi research group, kindly answered our questions about this great resource. Reference healthy wild-type gene expression, integrated from RNA-Seq and other data types, made comparable in human and 16 other animal species. 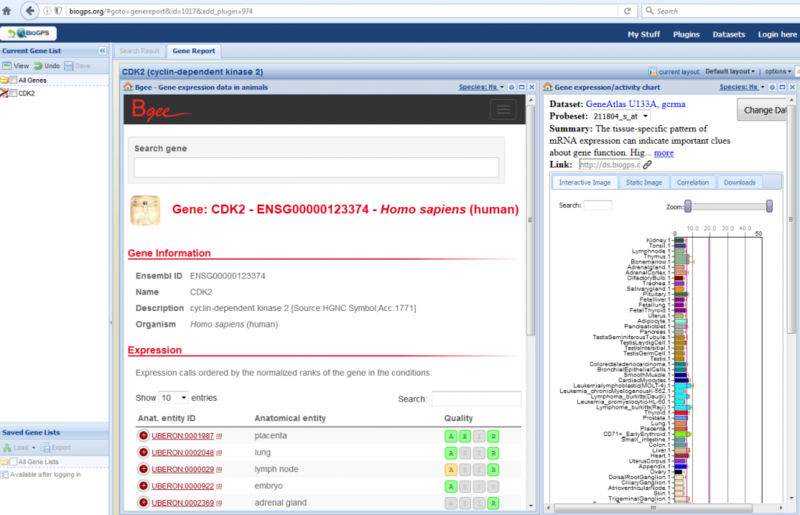 Bgee is a unique resource which allows to retrieve and to accurately compare gene expression patterns in multiple animal species. Its database integrates all sources of expression data, from the anatomical detail of in situ hybridization, to the genome coverage of RNA-seq. It provides a reference dataset of wild-type and healthy, as well as high quality and comparable, gene expression data in animals. To this aim, we perform stringent quality controls, and annotate and re-analyze all RNA-seq, microarray and EST data integrated in Bgee. The database currently includes 17 animal species. Bgee thus provides a meaningful overview of the expression pattern of genes, in all the species included. By using a unique sorting algorithm we developed, we rank the anatomical structures and life stages in which a gene is expressed, according to their relevance in term of gene function. For this, we take into account all sources of expression data together, which is unique to Bgee. In addition, we also provide precise annotations of anatomical homology (e.g., lung-swim bladder, forelimb-pectoral fin, tetrapod parietal bone-actinopterygian frontal bone). This allows accurate comparisons of gene expression patterns between species. Bgee also provides some original analytics tools, such as TopAnat, which allows to discover the organs where a set of genes is preferentially expressed (see answer to question 5). to compare their results with data in other species. Our objective was to allow meaningful comparison of gene expression patterns between species, in order to study their evolution (Bgee actually stands for “dataBase for Gene Expression Evolution”). It turned out that, to this aim, we needed to provide a reference dataset of normal, healthy and wild-type, gene expression in multiple species, from multiple data types. This therefore led to the development of a more advanced and complete tool. We were particularly excited when we noticed that TopAnat was so sensitive that, when provided with a list of genes randomly picked from an expression dataset, could detect which organs where sampled in the source experiment! This is actually an interesting finding about our tool, about which you can learn more on our blog. We are currently in the process of integrating new species, and very large datasets (e.g., GTEx reannotated and reprocessed). We are also optimizing the use of anatomical homology information in the web interface, which will allow users to leverage expression data in an innovative way (e.g., conservation scores of expression of orthologous genes in homologous tissues). A subteam in the group of Prof. Robinson-Rechavi, managed by Dr. Frederic Bastian, at University of Lausanne and SIB Swiss Institute of Bioinformatics, are working behind this tool. Thanks to Dr. Frederic Bastian, for updating the plugin and guiding us through this extremely useful and FREE tool. Be sure to check out their plugin in the plugin library.